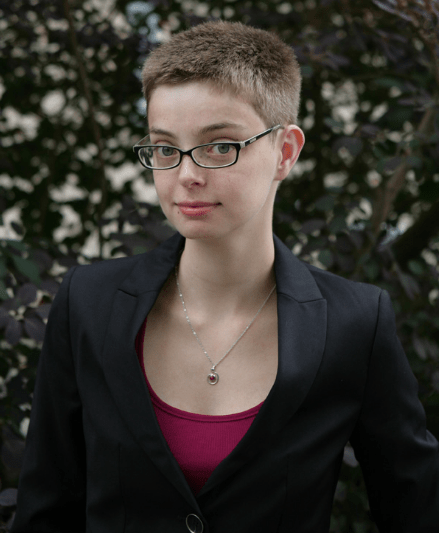 Today, we continue our ongoing new series “SFF in Conversation” with a guest post from Corinne Duyvis, author of the excellent Otherbound and co-founder of Disability in Kidlit, a website that focuses on the portrayal of disability in children’s literature. Growing up, I was a part of the privileged majority in nearly every way: I was female, yes, but I was white, middle-class, thin, cisgendered and ablebodied, and as far as I knew back then, I was straight and neurotypical as well. I never realized any of that at the time. Even after I figured out that I wasn’t quite so straight and neurotypical as I’d thought, it took several more years to become consciously aware what exactly it meant for me to be, for example, white. Looking back, that horrifies me. Not only are the privileged privileged, we don’t even have to be conscious of it. We can wander along blissfully unaware, raised to believe that we’re the normal, default state, and that everyone else somehow deviates. It’s the case in real life, and it’s the case in fiction, too. We don’t notice what’s common. It’s like noticing a book has white pages, printed letters, a barcode on the back: not exactly something you need to point out every time, right? Not exactly something you even consciously notice anymore. They don’t need to. It’s assumed. Except white protagonists are not the same damn thing as white pages, and it’s abhorrent that we’ve been brainwashed enough to see them as equally similar. This single, narrow type of person is the default human being for far too many people. Countless conversations about marginalization and misrepresentation have shifted my thinking in many ways, including this: I notice now. I notice when a room is all-white. I notice when a book is all-straight. I notice when several books in a row do not acknowledge disabled characters. I notice when I haven’t even seen a book with a trans protagonist in months. Noticing is step one—but oddly enough, it’s often glossed over. Promoting diversity will be framed as charitably lifting up poor underrepresented groups—*cringe*—but will rarely acknowledge the logical flipside of the story. As a rule, people are only marginalized when others marginalize them. Worse, many people don’t want us to notice. They’ll talk about diversity and anti-racism, but will interpret people pointing out whiteness and straightness as an insult rather than a fact. They’ll see it as an attack, because they’re used to comfy invisibility-as-default. They’ll praise “colorblindness” as though it’s something to aspire to. “Colorblindness” as an ideal has been criticized at length by many, many smart people—let’s listen. Don’t strive to make the marginalized invisible; strive to make the privileged visible. It’ll make people uncomfortable. Trust me. They’ll live. The least the privileged can do is be aware of it. Notice. Again and again and again, until it drives you to frustration because it’s everywhere. Until it drives others to frustration because they’re starting to notice, too, and now they can’t stop either. Do not allow the barrage of majority narratives to pass unremarked upon. Do not let the privileged be the default. About the author: Corinne Duyvis is a lifelong Amsterdammer and former portrait artist now in the business of writing about superpowered teenagers. In her free time, she finds creative ways of hurting people via brutal martial arts, gets her geek on whenever possible, and sleeps an inordinate amount. This post resonates so much with me right now. I just finished Ben Peek’s The Godless, a wonderfully diverse novel, which consequently contained references to skin tone for most characters when they were introduced. A few chapters into the book I found myself noticing this fact and that I found it jarring, only to realise that the times I found it jarring was when the characters were described as white. It is exactly what you described above about the invisibility of the norm and that pointing it out is uncomfortable. I found it painful to realise that I reacted this way, as I expect better from myself and failed in this instance. Can I just say how much I fracking love Corinne Duyvis? Wish there were more authors like her!